So naturally you were excited to do father and son activities, such as my Cub Scout soapbox derby race, or when we gathered wood for campfires on trips, or other allowance-earning stuff like helping you with lawn work. Except, I don’t have such great memories of those times. I spent a lot of my young life (mostly during and after grade school) wishing to break away from our family. There was a deep longing for a place I’d never been to, like I was a messenger tasked with delivering an important communiqué—and who was late embarking on his uncertain journey. I had glimpses of life on the road—living away from home while at Lakewood Community College, living abroad with Abi for a month, and attending school again in Iowa. Each step away from the nest felt like another rung up a ladder to some higher place. I just didn’t know where it was all leading to. Later, returning home from Iowa in 1985, when baby brother had left for college in Wisconsin, you and Mom realized you’d soon be empty-nesters. After I’d landed a fulltime job in Hopkins that summer, I was ready for that next big step into adulthood. And so commenced our father-and-son-first-apartment-planning sessions. Just before 10 a.m. on Wednesday, May 4, 2016, I was looking up at a pine tree in a backyard next to Grand Performance bike shop on St. Paul’s Grand Avenue. I was killing time in their back lot, waiting until they opened and could fix my bike. But that pine tree, with spring sunlight glinting through it. It was exactly like a tree I used to climb in our front yard in Olney, Md. You see, when I was not yet 10 years old, I often felt small in a hostile and loud world. I went off by myself a lot, and seem to remember talking to someone or something that was invisible. That “invisible friend” was benevolent and always heard me out and I felt much better. I recall this happening especially when I climbed trees. So why that tree now, in 2016? I’ll speculate it’s because I was only days into making my first change of residence in 10 years. I was seeing things anew. Even old things I thought I’d forgotten. And maybe it was also a way to speak to that invisible friend again, so I could calm weary feelings of being adrift in all the changes. 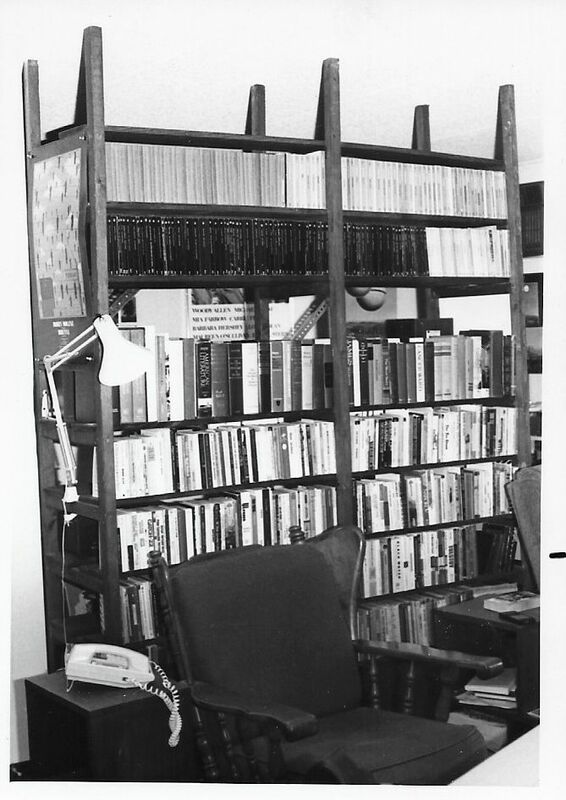 In February 1986, Dad and I attended a “Father and Son Banquet” at Bethel Methodist, our family’s church in Mound, Minn.
There’s never been a time in my life when I wasn’t surrounded by books. By the mid-’80s, I’d only added to my collection. And I’d be taking all my books to the new studio apartment. So Dad sketched out a plan for a floor-to-ceiling bookshelf. It was narrow by about a foot, but long enough to section off one side of the apartment (by about eight feet), making a sort of bedroom out of that corner. I had more than enough books then to fill the shelves on both sides (see photo above right, and at left). 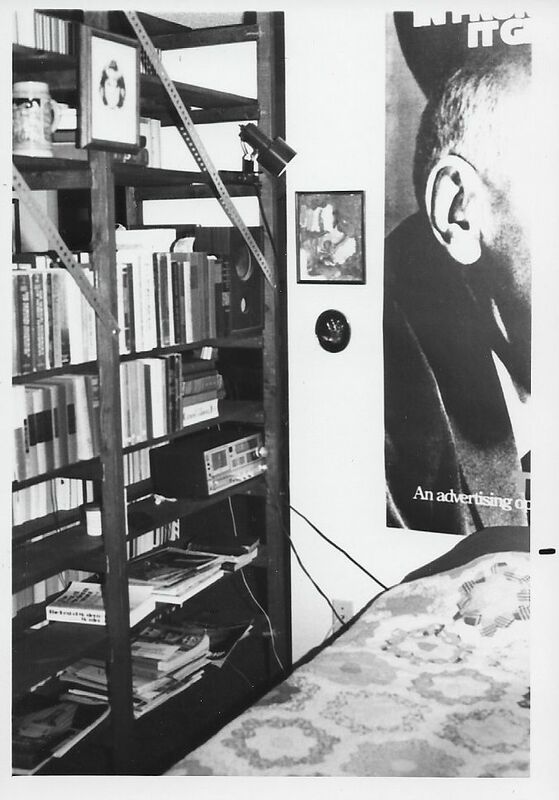 The “ladder” portions were the two ends and center, braced only by metal brackets on the bedroom side of the bookshelf. It looked rather fetching, and solved the book storage and room-dividing problem in a snap. I was nearly ready to make the first big move up, and into a place of my own. But had I finally arrived to where I was meant to be? ~ by completelyinthedark on May 13, 2016.